Well, getting close to Race Time! 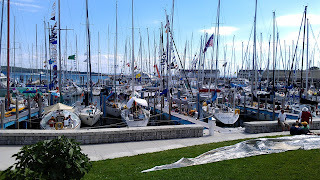 This Saturday, July 21st, Maskwa will be starting at 1210 on another Race to Mackinac. Personally, this will be my 10th race; Manny, our own Old Goat, will be racing his 28th, Don is on about 14, and on down the line. If you would like to follow us up the lake, you can click on this link. We are in Section 5. The Section menu is on the left hand side; just click the section, and follow us up the lake; simple no? There have been lots of problems with race tracking in years past, however this company has an excellent reputation with race tracking equipment, so hopefully you will get close to real time updates. 4 days to go. 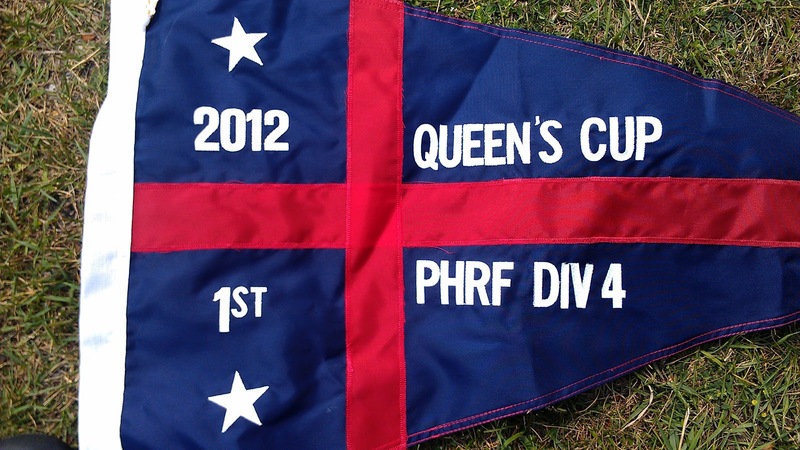 Maskwa has a 1st in the Queen's Cup, a 2nd in the NOOD, a 2nd in the Chicago - Waukegan… we're race ready if we ever have been. 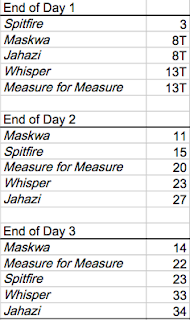 Pray for strong (Maskwa favored!) winds, and a safe journey. Strong winds, fair skies, and following seas. Friday we met at the dock in Milwaukee, Maskwa all ready to go. Don and Anthony had delivered her up overnight on Thursday, and then Ryan, Ute, George, Sonja and I took trains up later on Friday. However, when we motored out for the start, raised the sails, and started working the start line, there was plenty of wind. Starts were on 10 minute intervals, and we had a good 30 minute clock running. We started towards the high end of the section; Section flags were actually start sequence flags, so we were mixed in with the section faster than us. Any way you look at it, we had a great start, close to the line but no real danger of going over; Ryan called his first big start, ("43 boat lengths from the line, Don!") and we were off and racing. Night fell, and we settled in for some good sailing. Maskwa was humming right along, we were averaging about 5 knots, and we had all hands on deck for the night. Not necessarily awake, though. Clip on to the jack line, and nap on the rail. Eventually, the winds started to clock around to be more southerly. We changed from our #1 to the JibTop, thinking we would get maybe 1/2 a kt out of the deal, but every time the wind clocked a little bit further south, it increased; we picked up 1.5 - 2 kts every time. We had the JT up for a good half hour or so, and then the wind came forward-- we went back to the #1. 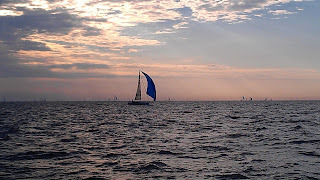 We traded sails every now and then, eventually settling in with the JT and us hiking out on the high side; we had 8 kts of boatspeed consistently, and started to see a regular dose of 9.0 and 9.2. With only 4 of us out on the rail, some of the gusts were a little strong. We probably had that sail up for a good 5 hours. We were really delivering the mail now. We heard the sleds start to call in their finishes, and we knew that flying along as we were, we would not be that far behind them. We picked out a few of the lights, and started shooting bearings from other boats, and we were passing boats at quite a clip. The problem, is that at night, you don't know if you are passing that boat you owe 120 seconds/mile, or someone from your own section. You just have to sail fast, and stay that way. Let's say the first 14/16ths of the race was excellent. We were about to have a 'moment.' We were 4 miles out or so, and the wind shut off. It was just like closing a curtain. We were zipping along, telling jokes about how slow 7.5 kts felt, when... suddenly we could only make 5. And then 4. And... it kept getting worse. In short order, we were bobbing about, half a knot of speed, but in 3 foot seas. We were trying not to destroy the new main sail, but we were still racing. And then... the fleet started to catch us. We had watched Nighthawk fall further and further behind... we could see their red a-sail slowly getting larger. And if they were catching us.... who else was? This is where we were as dawn broke. There was just no getting over it... we were going to have a repeat of the week prior, when we managed to catch everyone up front, and then boats were going to go flying past us, seeing the hole we were in. And yet.... and yet... somehow... we managed to keep moving. 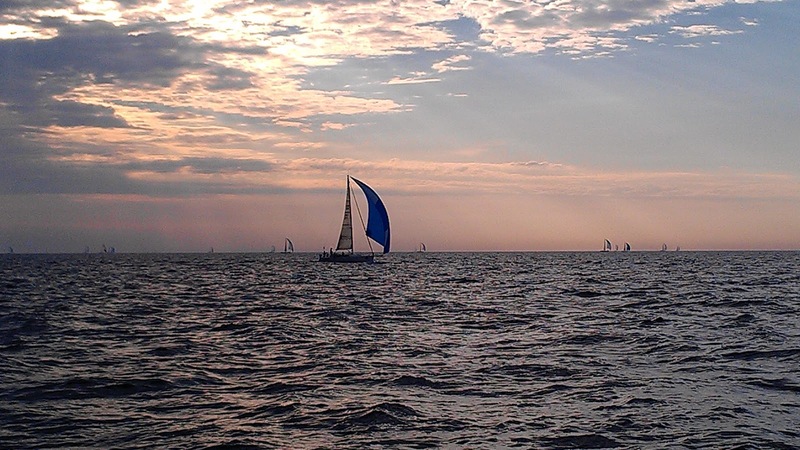 A few nearby boats had some way, and we were managing a good 2 kts directly towards the finish thanks to the waves. We had room, and we needed a sail to catch the lightest winds. The wind had moved, also.... we were directly up from the finish, making it a dead down run. We hoisted the big chute, dropped the JT, and slowly, painfully, worked our way across the remaining miles. It is very painful to hear the sails flogged like that. 3' seas and no winds... ouch. Ever so slowly, we pulled away from the boats that were dogging us. Nighthawk had been a stone's throw behind us, and they slid up high and exited the area where the pressure was building. 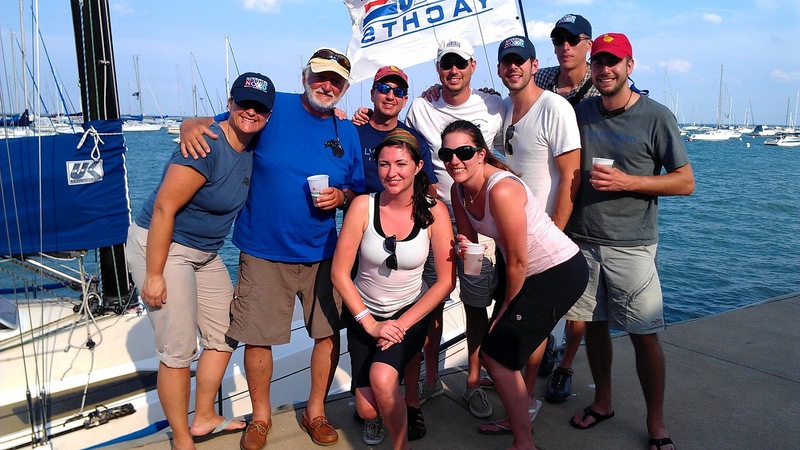 We got back up to speed... then we were doing 4 kts, had plenty of way, and were making a bee line for the finish. We got the finish signal, yelling a few congrats to each other, and then started dropping our gear to motor in. As we came into the harbor, the only boats we could see from our section that we knew about ... were almost none. Liberte was there... but we didn't know how long she had been there. Could we correct over her? A few hours later (and a drink and a nap later,) they posted the uncorrected finish times. George and I grabbed our section list, and started ticking off boats. 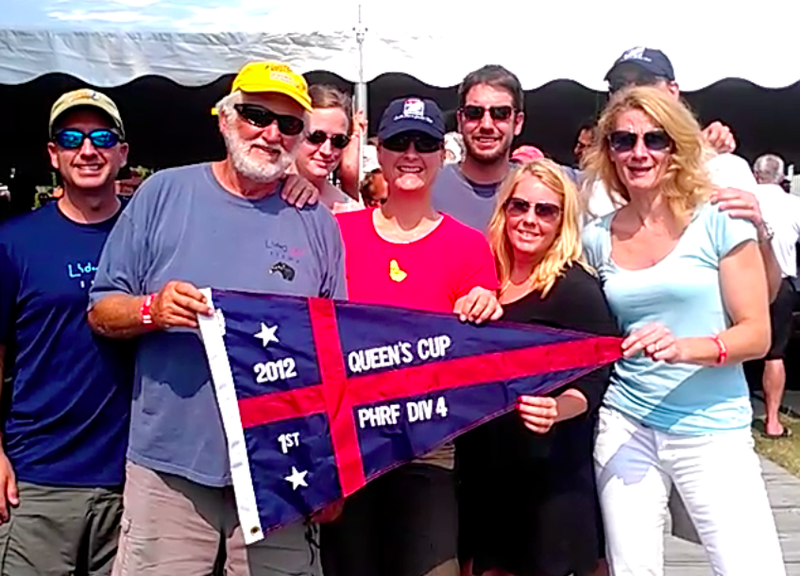 When we finished, we had accounted for all boats in our section, and only 1 finished ahead of us scratch, and Liberte owed us almost 7 minutes; she had beaten us across the line by 3:39. 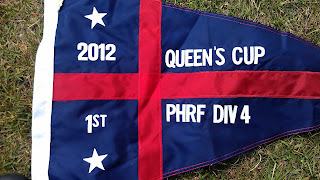 1st Place in The Queen's Cup. It was a great crew we had that night. Everyone pulled their weight, and more! We all took turns at different positions on the boat, just to give each other a break. It was a great night, and a better morning. On to the next race!! 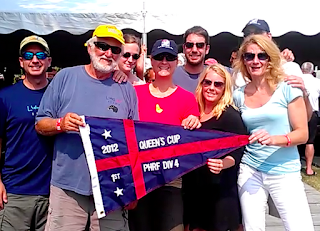 This weekend is Father's Day weekend, and we are not doing the Hobleman regatta as we were originally listed for. No problems, a free weekend. If you are interested in doing the race, it is a fun time, not terribly long, and you can certainly knock out Saturday and make it back. If you can only do Sunday, there is no train that leaves early enough from Chicago to get you up to Waukegan Sunday morning for race start. So you will either have to drive up early Sunday morning, or take the train up Saturday evening and sleep on the boat. This is a great race from Milwaukee to South Haven, Michigan (this year… destinations vary by year.) This is a night start in Milwaukee, or an evening start, at any rate, on Friday, June 29th. Don will need help delivering Maskwa to Milwaukee Thursday. Plan on leaving BPYC roughly 2PM, which would mean an arrival in good weather in Milwaukee at 3 AM (at the earliest.) It is a time commitment. We will be leaving Friday to cross the lake. 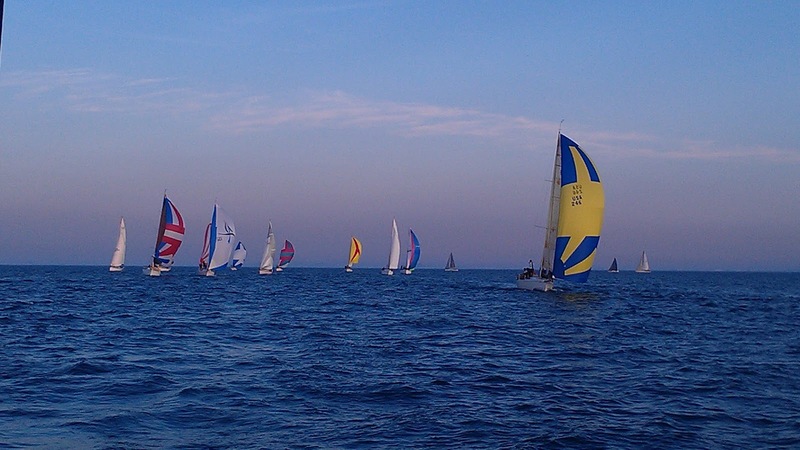 The race is a good time, it is a great way to get checked out sailing at night. Because it is a long, port-to-port race, things happen a little slower, and we are all tuned up for safety. If you wish to come, you will need good foul weather gear (it gets cold out there,) but if you do not have your own, you can usually borrow some from a crew member who is not doing the race. If you are interested, please let me know. 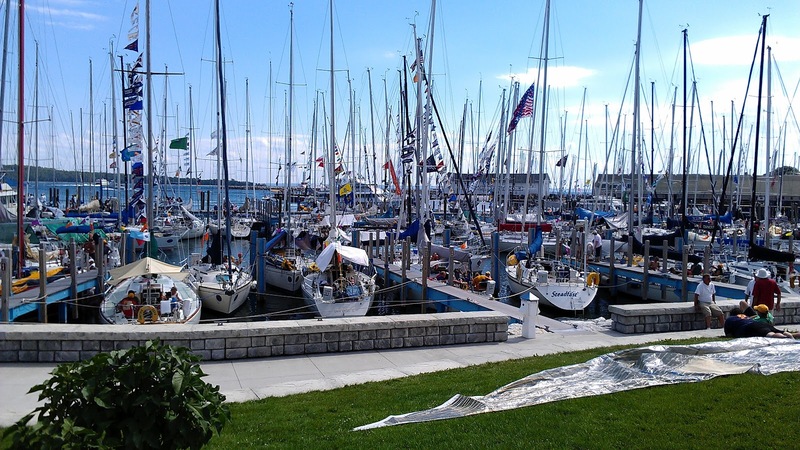 We are starting to get people interested in the Mackinac delivery, the reposition/cruise sail to Beaver Island, and the Harbor Springs Regatta. If you are maybe on the fence, or any of that seems to feel like it fits the cut of your jib, let me know, so we can start putting together who is going where and with whom. Well, that was quite a weekend! Maskwa with a 2nd in ORR4, a very unfavorable rating for us. Don and I will be recrunching the numbers to see how we would have done under PHRF. Either way, we'll take the 2nd Place to the bank. 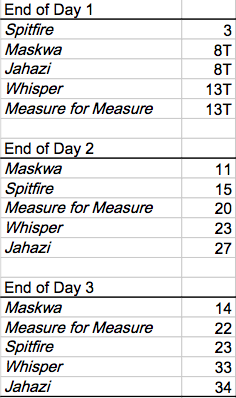 Longer post to follow, but great racing, Maskwa!! This will be totally different. We will not start out at our home at BPYC, because of the NATO Conference. The "Plan" according to the city (from what I have gleaned, and from dim memories of a condo with The Bear,) is to open the harbor the weekend of May 26th. We have a regatta to run as R/C Sunday the 20th, (The Abe Jacobs,) But so far things are up in the air as to weather or not they are going to reschedule the regatta to run on another day, run it from 31st street, etc. In addition to THAT, The Spring Opener and Olympic Cup are the following weekend, and these are great tune-up races if we can get out there to start polishing up our skills. However, we may be operating out of 31st Street. The Area III Schedule is not finalized yet! Most of the races will be on the weekends that they indicate on Crewsignup or the Area III website (especially the major ones, the NOOD, the Verve, the Mac, Michigan City, Queen's Cup, etc…) but a few of them have possible date changes coming soon (actually the Area III scheduling meeting to take care of that is supposed to be tomorrow, Wednesday March 21st.) More news if there are any major changes. Check the blog; I'll be posting info on there once they get the schedule ready, and of course, all emails will be doubled-up there.